Review by AllTheBestFights.com: 2016-04-09, one sided fight between George Groves and David Brophy: it gets two stars. George Groves entered this fight with a professional record of 22-3-0 (17 KOs=77%) and he is ranked as the No.9 super middleweight in the world (currently the #1 in this division is Arthur Abraham). He lost to Badou Jack in 2015 (=Groves vs Jack) but he came back to win in 2016 beating Andrea Di Luisa (=Groves vs Di Luisa). His opponent, the undefeated David Brophy, has a boxing record of 16-0-1 (1 knockout) and he entered as the No.91 in the same weight class. He has already fought once in 2016 winning over Vaidas Balciauskas. 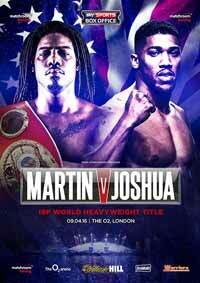 Groves vs Brophy is valid for the vacant WBA International super middleweight title; undercard of Charles Martin vs Anthony Joshua. Watch the video and rate this fight!